Esta película protagonizada por uno de los grandes actores del cine mudo, Douglas Fairbanks, tuvo repercusiones que llegaron hasta la presidencia de Estados Unidos. Pero vayamos por partes. La filmación de este western que inició en enero de 1918 contó con el apoyo del Director de la United States Railroad Administration, William Gibbs McAdoo, a la sazón yerno del presidente Woodrow Wilson. Al finalizar la Primera Guerra Mundial, este abogado se convirtió en consejero de la recién creada United Artists conformada por Charlie Chaplin, D. W. Griffith, Mary Pickford y Douglas Fairbanks. McAdoo prestó ocho carros Pullman y doce vagones de carga a Fairbanks para transportar cerca de doscientos vaqueros e igual número de caballos de Los Ángeles, California a Tucson, Arizona, lugar donde se llevaría a cabo la filmación de Headin’ South. (1) El Saguaro National Monument East fue el lugar elegido para rodar la película. El guión fue escrito por el director Allan Dwan, quien en esta ocasión se convirtió en productor ejecutivo, dejando la dirección a Arthur Rosson. 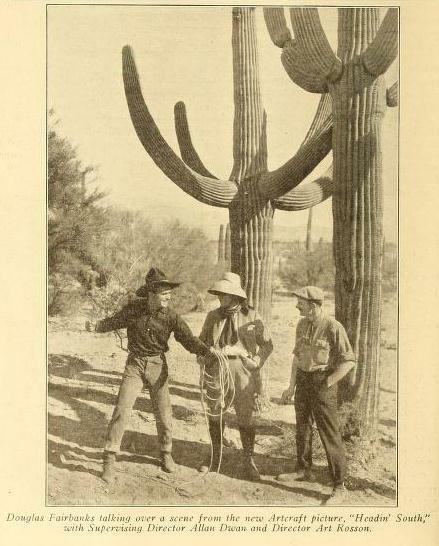 La producción corrió a cargo de la Artcraf Co., compañía propiedad de Douglas Fairbanks quien desembolsó todos los gastos para las cerca de 500 personas –cantidad que considero exagerada– que conformaron el equipo que llevó a Tucson y según la revista Variety, la cinta costó 190,000 dólares. (4) La película requería que Fairbanks superara las escenas acrobáticas de sus anteriores filmes, en especial de The Man From Painted Post, a la vez la cinta llevaba la historia a diversos escenarios que iban desde Canadá hasta México y se apreciaban montañas nevadas, planicies del medio oeste americano y desiertos inhóspitos. For the Program: Fairbanks as a “good” bad man. A dizzy debauch of daring deeds and startling stunts. Advertising Phrases: The Fairbanks of the Rio Grande. As a bandit, “Doug” is a perfect gentleman—but active. Feature this Player: It will be best to concentrate upon Fairbanks. Stunt Suggestions: Borrow or fake a large compass, and send a man through the streets with it. He should hold the box so that the card will show, and should never divert his attention from it. From the box hang a sign reading. 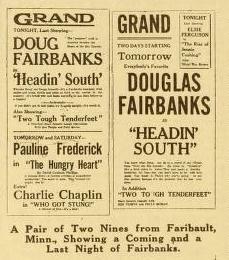 “I’m headin’ south to see Douglas Fairbanks in ‘Headin’ South’ at the (house and date). And. man, believe me it’s a scream—some scream.” It will help if you can rig an auto steering gear to the box by which the man may “steer” his course. With a little trouble a light framework boat can be built to suspend from his shoulders. For the lobby use the cut-outs you probably already have, draping the face in a black mask. For the street wagon use the posters. No era común un despliegue publicitario de tal magnitud para una cinta de esa época; contadas cintas merecían tanto, pero la presencia de Fairbanks y su popularidad eran perfecta justificación para ello. La historia que muestra ambas fronteras norteamericanas, la mexicana y la canadiense, fue el debut de Rosson como director de la compañía propiedad de Fairbanks y la integración de Katherine MacDonald al equipo. La actriz con ciertos éxitos y reputada atleta era una de las favoritas del presidente Woodrow Wilson, por ello no es descabellado que su inclusión en la cinta tuviera otros fines más allá de lo cinematográfico, siendo que el yerno del presidente también estuvo involucrado, pues proveyó el transporte. Douglas Fairbanks’ in Artcraft Picture by Allan Dwan Takes Part in an Exciting Man Hunt. 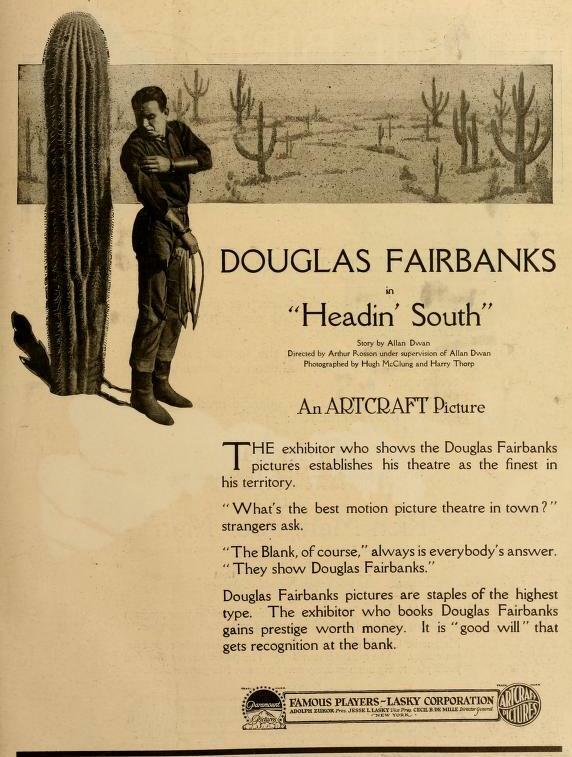 The latest Artcraft picture, “Headin’ South,” is a lively melodrama with Douglas Fairbanks comedy trimmings. His mission in the story is a serious one, but he accomplishes it with his usual display of joyful zest in living and doing the impossible, and the laughs are never separated by long stretches of dramatic intensity. “Headin’ South” is the name assumed by an officer of the Canadian Mounted Police, who trails a murderer from the Far North down through California and into Mexico. The fugitive is known as “Spanish Joe,” and, once south of the Rio Grande, he puts himself at the head of a band of Mexican outlaws and starts to raid on both sides of the border. “Headin’ South” pretends to be an outlaw himself, and becomes a member of the band. The estate of a wealthy Mexican family is captured by the marauders and made their headquarters. “Spanish” Joe is attracted by the beautiful daughter of the house, and the Canadian officer has to use his wits to prevent the girl and the other women of the household from being ill-treated before the arrival of a company of Texas Rangers. He is successful, of course, and is rewarded with the love of the beautiful Spanish maiden. “Headin’ South” has no side issues, and contains sufficient real interest in its serious moments to keep a tight hold on the attention of the spectator. It is not the biggest laughing hit of the Fairbanks series, but is always entertaining, and will cause many a grin and chuckle. The star does his work in the regulation Fairbanks fashion, and everyone knows what that means. The production is a fine one. Directed by Arthur Rosson under the supervision of Allan Dwan, and photographed by Hugh McClug and Harry Thorp it presents a number of picturesque views of the Land of the Snows, and the Mexican scenes are equally impressive and true to life. The rides of the bandits and the Texas Rangers are full of thrills. Artcraft Picture with Douglas Fairbanks. A unique and distinctive mystery plot is the basis of the most recent Fairbanks feature, written for the star by Allan Dwan. It is a story that presents unlimited opportunities for the popular athletic star and each one is taken full advantage of. Fairbanks is everywhere and his dominating personality is, as usual, a singular advantage. The story relates an episode during the recent troubles on the Mexican border, the chief characters of which are a stranger, who because of his traveling tendencies is dubbed “Headin’ South”; and a Mexican bandit who has earned the soubriquet of Mexican Joe. The action of the plot is traced from the innermost depths of the Canadian north country, to the far-off deserts of the Mexican border. This furnishes quite a variety of natural beauty; the Canadian forest scenes are rich in their regal splendor, while the cactus fields of Arizona offer just the opposite extreme of a barren country. The many exteriors have been well selected and are in keeping with the atmosphere of the plot. 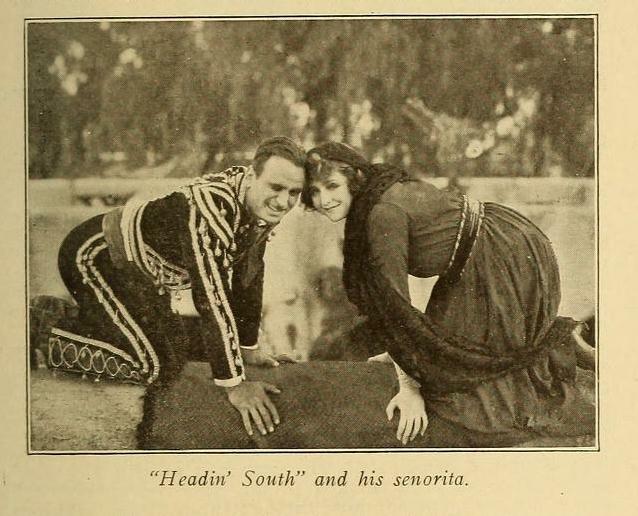 Catherine MacDonald is a pleasing personality as the Mexican senorita, who later becomes a blushing bride, and adds materially to the interest of the story. Frank Campeau, who has been seen in many of the Fairbanks’ pictures, is again seen as the villain in this picture; Campeau plays Mexican Joe, a role that is peculiarly suited to his talents. The only Doug plays the dashing hero “Headin’ South,” who creates the impression, at first sight, of being a ferocious villain. Arthur Rosson directed, under supervision of Allan Dwan, and the masterful manner in which the big scenes were handled is tribute to his excellent work. (Headin’ South). Marca “Artcraft.” 1500 mts. (1) Motography, Vol. XIX, No. 4, Jan. 26, 1918, p. 183. (2) The Moving Picture World, Vol. XXXV, No. 5, Feb. 2, 1918, p. 696. (3) The Moving Picture World, Vol. XXXV, No. 5, Feb. 2, 1918, p. 696. (4) Variety, Vol. L, No. 10, May. 3, 1918, p. 43. (5) The Moving Picture World, Vol. XXXV, No. 9, Mar. 2, 1918, p. 1272. (6) The Moving Picture World, Vol. XXXV, No. 11, Mar. 16, 1918, p. 1557. (7) Motography, Vol. XIX, No. 11, Mar. 16, 1918, p. 521. (8) Cine-Mundial, Vol. III, No. 4, abril 1918, p. 189. (9) Motography, Vol. XIX, No. 13, Mar. 30, 1918, p. 596. (10) Cine-Mundial, Vol. III, No. 5, mayo 1918, p. 259. (11) Cine-Mundial, Vol. III, No. 7, julio 1918, p. 383. (12) México visto por el cine extranjero, vol. 1, Emilio García Riera, Era/U de G, México, 1987, pp. 64-65. (13) México visto por el cine extranjero, vol. 2, Emilio García Riera, Era/U de G, México, 1987, pp. 71-72.